Close to a number of restaurants and malls these new offices have glass walls and doors to provide light and airy spaces. They are available on flexible terms while there is also a meeting room, breakout area and receptionist available. With six small (private) offices available in this modern and exceptionally well equipped office building the space is ideal for businesses looking for more privacy than offered in traditional large buildings. Fantastic, modern workspace in the heart of Valencia. Just minutes from the San Fernando Valley and city of Los Angeles, Valencia is one of California’s most thriving and desirable communities to work and live. This modern and fascinatingly renovated landmark medical building is closely situated next to I-5/126 freeways and is situated in Valencia, CA. In addition to the fantastic range of convenient local transport networks and road and rail services available throughout the surrounding area; this business center also has spacious and highly professional rooms available in a chiropratric / medical office, very close to a multitude of attractions and amenities. Tis building is easy to reach from the intersection of Magic Mountain Parkway and Tourney Road. The San Fernando Valley is also just 10 minutes away. This centre offers serviced offices in a comfortable and professional business environment. An attractive venue for your Valencia headquarters. The regional transport links are excellent also and offer a range of convenient and frequent services throughout the locality. This center is surrounded by the lovely atmosphere provided by the communities of Santa Clarita. Offering suites, including full-service office space, virtual office addresses, day offices, meeting room rentals, and much more; this center is truly exceptional. This center boasts over 23,000 square feet of available space, accommodating businesses big and small. This center is close to local transportation stations. 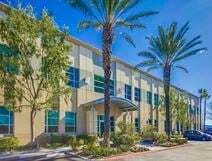 This executive and highly prestigious business center is situated exceptionally close to the I-5 and to the popular and locally renowned amenities and services of Valencia center. This major business park offers highly significant and effective technological facilities and secure, high speed internet access, conference facilities, kitchen facilities and administrative and secretarial services with easy parking.